Looking for a solitaire game in Pretty Good Solitaire to play? Busy Aces is a game in the Forty Thieves type. It is neither particularly hard nor particularly easy, but is simple to play if you have played any other games of its type. You try to build as many cards in the tableau as possible, being restricted in that you can only move one card at a time. Your object is to find the 8 Aces and move them to the upper foundation piles and build them up in suit to Kings. Deuces is very similar to Busy Aces, but instead of starting the foundations with Aces you start with Twos. The Twos are also all dealt out for you at the start of the game, but there are 2 fewer tableau piles than Busy Aces - making the game a bit harder. Three's Company is just like Deuces, except again a little bit harder. Instead of starting with Twos, you start with Threes. Instead of 10 piles, you only have 8. But this time, you can move groups of cards if they are down in suit. While harder than Deuces, Three's Company is also more interesting. In fact, this is my favorite of the game's of this type. Fours Up is the next game in the series. Instead of starting with Threes, it starts with Fours. Instead of 8 piles, there are now only 6. Now building is down regardless of suit instead of by suit (which makes it easier), but you can still only move groups of cards by suit. This makes for a harder game than Three's Company. Next we have Penta. This time we start with Fives. While we still have 6 piles, now half the tableau and foundation piles build up and half build down, making the game more complicated. The next game changes it up again. This time, we have both Sixes and Sevens. Building on the Sixes is down, building on the Sevens is up. This game changes the pattern as it is turns out is it quite easy to win. Finally, if you want easy to win, this is the game for you. I challenge you to play properly and lose this game. It probably cannot be done. Fortune favors you always in this game. We go back to 12 piles, build from Aces - and you will never lose. There you have it - 7 solitaire games to keep you busy on a rainy day - some easy, some hard. Demons and Thieves is one of my first and most successful inventions. It has a split tableau, on the left side the tableau is like the game Canfield and on the right side it is like Forty Thieves. Demons and Thieves has been so popular it has its own variations, generally to make the game a little harder. Lady Jane is a two deck Klondike variation named after our cat Lady Jane. It is very easy to win but is nevertheless quite popular. Free Fan is a variation of the classic game Fan. It adds two cells to make Fan easy and also more strategic. Free Fan was invented by Gregg Seelhoff. Triple FreeCell is a 3 deck variation of FreeCell. As you can see, there are a lot of cards. It is safe to say that it is going to take you a lot longer to win Triple FreeCell than regular FreeCell. Agnes Three is another 3 deck original game. It is a 3 deck version of the game Agnes Bernauer, which is a Klondike type game. Thieves of Egypt is a popular original Forty Thieves type game. It takes a standard Forty Thieves type game and changes it to have a pyramid shaped tableau (most Forty Thieves type games have the same number of cards dealt to each pile). Antares is another original game with the split tableau (like Demons and Thieves). With Antares the tableau is split with one half like Scorpion and the other half like FreeCell. This combination has proven to be both interesting and popular. That's 7 of the most popular original games in Pretty Good Solitaire - there are hundreds more, some of them variations of these 7 games. Sometimes you don't want a challenge. Sometimes you want to play a game that is easy. Pretty Good Solitaire has many challenging games in it, but also many easy one. Here are 5 matching games - these are games where you match pairs of cards together. These are very easy games to play and also are great for kids. Nestor is an easy game to play, although not necessarily easy to win. Just match cards that are of the same rank (for example, pair two Jacks). Similar to Nestor but easier to win, Vertical also involves pairing cards of the same rank. Doublets is another pair matching game - this time, some cards start the game face down. Monte Carlo is also a game where you pair cards of the same rank - but now it matters where the cards are. You can only pair cards of the same rank (such as two Kings) when they are adjacent to each other, either horizontally, vertically, or diagonally. Finally, Pelmanism is a classic pairing game, sometimes called Concentration or Memory. All the cards start face down and you turn them over to find pairs. The trick is remembering where all the cards are, since once two cards are turned over that don't match, all the cards get turned face down again. Have fun playing these simple matching games in Pretty Good Solitaire. 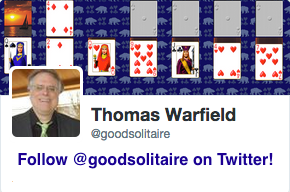 Everybody knows the solitaire game called Klondike (just called Solitaire in Windows). But Klondike has many variations, many of which are better games to play than Klondike itself. I have a complete list of these games, but here are a few of the most interesting ones. Double Klondike is just the game Klondike with 2 decks. It plays the same but with more cards - and more opportunities to play cards. Gold Rush is the same as Klondike, except you only get 3 times through the deck (2 redeals). The first time through, it deals 3 cards at a time from the stock to the waste, the 2nd time it deals two cards at a time, and the last time it deals one card at a time. This is a great compromise between the usual one card deal and three card deal settings in Klondike. It also happens to be one of my favorite games, but then I invented it. Batsford is another 2 deck game like Double Klondike. It adds an extra element of a reserve pile where 3 Kings can be stored. It's a challenging but interesting game. King Albert is a different kind of Klondike game - it is an open game (all cards face up), which is more usual among FreeCell type games. It's also a very difficult game, but worth learning. Northwest Territory is like Klondike but adds a large reserve pile in which every card is available for play. This makes a lot more cards available for play than is usual in Klondike type games. This is also another of my inventions. Carlton is another open game, this time with 2 decks. It is also challenging but the 2 decks give lots of opportunities for plays. This is one of the better 2 deck Klondike games. Finally, Hypotenuse is another 2 deck game. This time, instead of a stock and waste pile, you have only a stock that deals one card to each tableau piles. This is another challenging game. If you are a Klondike fan, I'm sure you'll find some games of interesting among these seven games. 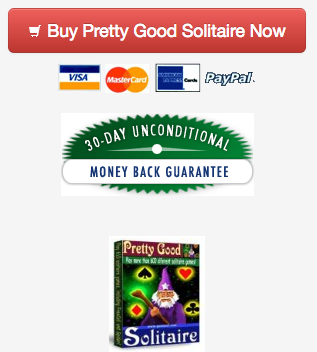 There are a few solitaire games in Pretty Good Solitaire that are very difficult to win. For many of them, winning just involves luck of just getting the right cards. But there are a few very hard games that involve skill rather than just luck. These are games worth playing even though most of the time you will never win them. The game Seven Devils is so named because of a reserve pile of 7 cards. These 7 cards can only be played to the foundation piles (the piles where you build cards up from Aces to Kings). The situation is not helped by the fact that you can move only one card at a time in the 7 pile tableau. A very hard game, but similar to the popular game Klondike. The key to winning is to get those 7 devils out. Interchange is an even more interesting game of the Forty Thieves type. It features a tableau of alternating face up and face down cards. Because there are so many cards buried in the tableau, it can be difficult to get at them all and the game is very hard to win. But there are some strategies to improve your chances. German Patience is an unusual game where all building is on the 8 tableau/foundation piles. All building is up regardless of suit and only one card can be moved at a time. The goal is to get all of the cards into 8 13-card sequences. The game is very challenging as you get more cards into play, you have less space to move them around. The devilish game Diavolo is a variation of the excellent game Rouge et Noir. Diavolo has 2 types of foundation piles - the left 4 piles are built from Aces up to Kings just like in most solitaire games (except they build by color instead of suit). The other 4 piles, on the other hand, are built as 13-card sequences down in alternate color in the tableau, then moved up to the foundation piles in 13-card units. Therefore you are building two different things at the same time. You have no redeals and the odds are against you. Still, you can help yourself by making the right moves (and learning the easier Rouge et Noir first is recommended). If you can manage to win these four very hard solitaire games at least one each, you can call yourself a solitaire expert. Although many people are unaware of it, there are many hundreds (and probably thousands) of different solitaire games played with playing cards. This can be daunting when you open a game such as Pretty Good Solitaire and see the names of over 800 solitaire games. Which ones are the most important ones? Here are 7 games that every serious solitaire player should know. Klondike is the name given to the game that most people just call Solitaire. It is the basic game that came with Windows. Klondike is not the best nor the most interesting of solitaire games, but it is the most popular. It also has all the standard elements (foundation piles for each suit, a tableau with alternate color building, a stock pile, a waste pile). Once you know how to play Klondike, a large number of solitaire games will seem familiar to you. Like Klondike, FreeCell was included with Windows. But while Klondike is a favorite of people just wasting time, FreeCell is a puzzle that takes thought and strategy. FreeCell's design is brilliant - it is easy to learn but not easy to win, but...significantly, it can be won nearly every time. FreeCell is a game that gets played thousands of times by its devoted fans. It has spawned many other games that try to imitate its puzzle-like style. Spider is another popular solitaire game that came with Windows. It is a much harder game for the casual player and therefore often is seen with 2 easier variants - Spider One Suit and Spider Two Suits. Spider takes some work to master and can be frustrating at times. Like most of the games in this list, there are many variations of the game designed to be easier or different or more strategic. Yukon is a fascinating game with similarities to Klondike, but with one special feature - you can move any group of face up cards regardless of sequence. This makes for a different and fun game. In order to win, you need to uncover the face down cards to turn them face up. Yukon's most famous companion game is Russian Solitaire, which is very hard since building is by suit rather than opposite color. If you like Klondike, you'll find Yukon a nice change. Forty Thieves is an important solitaire game to know. It has all the basics in common with hundreds of solitaire games - even more so than Klondike. Once you know how to play Forty Thieves, you know how to play a lot of games. Even better, Forty Thieves is challenging and interesting in its own right. Forty Thieves also has a rich history, being over 100 years old. It also has many other names, such as Napoleon at St Helena. Pyramid is a different type of solitaire game with different structure - in Pyramid you pair two cards together whose ranks add to 13 and remove them from play. This makes it an Addition or Pairing type game, rather different from the previous games. Pyramid is probably the best known and most played Addition type game. Once you learn Pyramid, you'll find that there are many other Addition type games, some of which are quite easy and others which can be interesting. Scorpion is very Spider like, but has only one deck and involves creating sets of 13 cards down in suit from King to Ace. It is easier and more accessible than Spider and is probably a better introduction to Spider type games than even Spider is. Also, it's fun. Scorpion also has some connection to Yukon, in that you can move any group of face up cards regardless of sequence. Scorpion is definitely a game to play if you haven't played it before.